Speaking of Underinflated Balls. . .
Did you catch the economic news yesterday? The U.S. economy hit “speed bumps,” according to the Wall Street Journal’s lede story, but it would appear that those berms may be quicksand traps. Fourth quarter economic growth came in at only 2.6 percent, well below the summer’s 5 percent pace. Given that the middling economic growth we have enjoyed has been largely consumer driven, it suggests a fragile economy that could grind to a fast halt if, for example, oil prices suddenly spiked or consumers get nervous. You don’t get sustained, high-growth expansions without a lot of capital investment. As the Journal editorial page notes, 2014 was the ninth year in a row with economic growth below 3 percent. Forget the analysis. 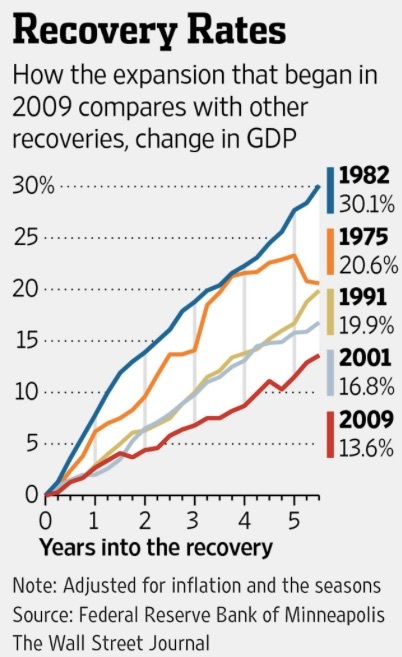 Just take in this chart, which tells the story vividly: the current economic expansion is the weakest in thirty years. Meanwhile, global economic growth is slowing. China is talking about the need for “stimulus,” Russia is predicting a 3 percent decline in GDP, (which means it will be probably twice that); the fun and games with Greece and the Euro are just getting started.